In 1988 Bechtel/Technip Constortium awarded BILFAL the 1st offshore turn-key contract in the Middle East for QGPC Qatar North Field Development. This Project consists of Engineering, Procurement, Fabrication, Erection, Load-out and Installation of 14 Nos. Jacket/Modules of Riser Ttreatment Platform, Flare Platform and Interconnecting pipe bridges along with various hook-up and commissioning activities together with tie-ins of the well-head platforms for a total wt. of 24,000 Tons. The project was successfully completed to a very tight schedule which required a peak total manpower of 1,800 (1000 at BILFAL Yard) with a total of 1,200,000 man hours. In 1990 a consortium of BILFAL , Saipem & Snamprogetti ( Italy ) were awarded a Contract from Saudi Aramco for fabrication of Production, Tie-in, Accommodation Bridge Support Platforms, Flare Tripod, Inter-Connecting Bridges, Mooring Buoy and its load-out and towage to offshore, hook-up and pre-commissioning of Safaniyah GOSP-4 field with a total weight of 28,700 Tons. The work required a peak of 1500 workers (900 in BILFAL Yard) for onshore activities and 300 workers for offshore installations. The continuous increase in oil export that has taken place in 1990 to meet the increasing global demands, necessitated to up-grade various export facilities in Saudi Arabia. As a part of this upgrading process in 1990 BILFAL were awarded a contract from Snamprogetti, Italy for the supply and fabrication of 17 Nos. Offshore Jackets and 3 Nos. Bridges for Saudi Aramco Yanbu Crude Export Facility. A total workforce of 800 employees were required (around 600 in BILFAL Yard) to execute the project successfully. 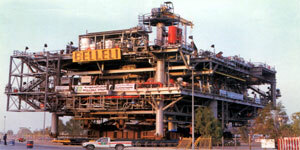 In 1997, Bechtel/ Saipem Consortium awarded BILFAL the offshore contract for the Reliance Petrochemical Jamnagar Refinery Complex in the West Coast of India. This Project consisted of detailed Engineering, Procurement, Fabrication, Assembly of Jetty Trestle, Pile Bends and Jackets, Jetty Trestle Truss Beams, Pad-eyes, Cat-walk, Interconnecting Bridges, Platforms with total weight of 13,000 Tons. The Project was successfully completed in a very tight schedule which required a peak total manpower of 800 (500 at BILFAL Yard) with a total of 1,000,000 Manhours.